The different air bag systems work independently of each other. The protective functions of the system work in conjunction with each other. Not all air bags are deployed in an accident. See "Children in the vehicle"
for more information on infants and children traveling with you in the vehicle and restraints for infants and children. is not lit while the engine is running. For your safety, Mercedes-Benz strongly recommends that you have the system checked as soon as possible at an authorized Mercedes-Benz Center. Otherwise the SRS may not be activated when it is needed in an accident, which could result in serious or fatal injury. The SRS might also deploy unexpectedly and unnecessarily which could also result in injury. In addition, improper work on the SRS creates a risk of rendering the SRS inoperative or causing unintended air bag deployment. Work on the SRS must therefore only be performed by qualified technicians. Contact an authorized Mercedes-Benz Center. If it is necessary to modify an air bag system to accommodate a person with disabilities, contact an authorized Mercedes-Benz Center for details. USA only: Call our Customer Assistance Center at 1-800-FOR-MERCedes (1-800-367-6372) for details. - Damaged seat belts or seat belts that have been subjected to stress in an accident must be replaced. Their anchoring points must also be checked. Only use seat belts installed or supplied by an authorized Mercedes-Benz Center. - Air bags and pyrotechnic Emergency Tensioning Devices (ETDs) contain perchlorate material, which may require special handling and regard for the environment. Check your national disposal guidelines. California residents, see www.dtsc.ca.gov/HazardousWaste/Perchlorate/index.cfm. - Air bags and ETDs are designed to function on a one-time-only basis. An air bag or ETD that has deployed must be replaced. PRESAFE ® has electrically operated reversible belt tensioners in addition to the pyrotechnic ETDs. - Do not pass seat belts over sharp edges. - Do not make any modification that could change the effectiveness of the seat belts. - Do not bleach or dye seat belts as this may severely weaken them. In a crash they may not be able to provide adequate protection. - No modifications of any kind may be made to any components or wiring of the SRS. - Do not change or remove any component or part of the SRS. - Do not install additional trim material, seat covers, badges, etc. to the: - padded steering wheel boss - knee bag covers - front-passenger air bag cover - outer side of front seat bolsters - outer side of rear bench seat backrest seat bolsters - roof lining trim - Do not install additional electrical/electronic equipment on or near SRS components and wiring. - Keep area between air bags and occupants free of objects (e.g. packages, purses, umbrellas, etc.). - Do not hang items such as coat hangers from the coat hooks or handles over the door. These items may be thrown around in the vehicle and cause head and other injuries when the window curtain air bag is deployed. - Air bag system components will be hot after an air bag has inflated. Do not touch them. - Never place your feet on the instrument panel, dashboard, or on the seat. Always keep both feet on the floor in front of the seat. - Improper repair work on the SRS creates a risk of rendering the SRS inoperative or causing unintended air bag deployment. - For your protection and the protection of others, when scrapping the air bag unit or ETD, our safety instructions must be followed. These instructions are available from any authorized Mercedes-Benz Center. - Given the considerable deployment speed, required inflation volume, and the material of the air bags, there is the possibility of abrasions or other, potentially more serious injuries resulting from air bag deployment. - side impacts (side impact air bags and window curtain air bags) - rollover (window curtain air bags) However, no system available today can completely eliminate injuries and fatalities. To reduce the risk of injuries during front air bag inflation, the driver and front-passenger must always be seated correctly and have their seat belts fastened accordingly. Since the air bag inflates with considerable speed and force, a proper seating position and correct positioning of the hands on the steering wheel will help to keep you at a safe distance from the air bag. Occupants who are not wearing their seat belt, are not seated properly or are too close to the air bag can be seriously injured or killed by an air bag as it inflates with great force instantaneously: - Sit with the seat belt properly fastened in a position that is as upright as possible with your back against the seat backrest. - Move the driver's seat as far back as possible, still permitting proper operation of vehicle controls. The distance from the center of the driver's chest to the center of the air bag cover on the steering wheel must be at least 10 inches (25 cm) or more. - Do not lean your head or chest close to the steering wheel or dashboard. - Only hold the steering wheel by the rim. Placing hands and arms inside the rim can increase the risk and potential severity of hand/arm injury when the driver front air bag inflates. 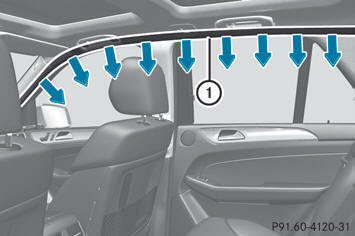 - Adjust the front-passenger seat as far back as possible from the dashboard when the seat is occupied. - Occupants, especially children, should never place their bodies or lean their heads in the area of the door where the side impact air bag inflates. This could result in serious injuries or death should the side impact air bag be deployed. Always sit as upright as possible, wear the seat belt properly and use an appropriately sized child restraint, infant restraint or booster seat recommended for the size and weight of the child. To help avoid the possibility of injury, please follow these guidelines: (1) Always sit as upright as possible and use the seat belts properly. The air bags are only deployed if the air bag control unit detects the need for deployment. Only in the event of such a situation will they provide their supplemental protection. The driver and passenger should always wear their seat belts. Otherwise, it is not possible for the air bags to provide their supplemental protection. It is important for your safety and that of your passenger to have deployed air bags replaced and to have any malfunctioning air bags repaired. This will help to make sure the air bags continue to perform their protective function for the vehicle occupants in the event of a crash. If the vehicle overturns, the front air bags are generally not deployed unless the system detects high vehicle deceleration in a longitudinal direction. The deployment of the front-passenger front air bag is also influenced by the weight category of the front passenger, which is determined by the Occupant Classification System (OCS). The lighter the passenger side occupant, the higher the vehicle deceleration rate required (predicted at the start of the impact) for second stage inflation of the front-passenger front air bag. In the second stage, the front air bags are inflated with the maximum amount of propellant gas available. - the system, based on the OCS weight sensor readings, detects that the frontpassenger seat is occupied. - the air bag control unit predicts a high impact severity. Driver's knee bag 1 deploys below the steering wheel. During a frontal impact, if the system determines that air bag deployment can offer additional protection to that provided by the seat belt, driver's knee bag 1 is deployed along with the driver's air bag. The driver's knee bag 1 operates best in conjunction with a properly positioned and fastened seat belt. Front side impact air bags 1 and rear side impact air bags 2 deploy next to the outer seat cushions. If the vehicle overturns, the side impact air bags are generally not deployed. They are deployed if the system detects high vehicle deceleration or acceleration in a lateral direction and determines that side impact air bag deployment can offer additional protection to that provided by the seat belt. If the OCS detects that the front-passenger seat is not occupied and the front-passenger seat belt is not fastened (the belt tongue is not engaged in the seat belt buckle), the side impact air bag on the front-passenger side will not deploy. The side impact air bag on the front-passenger side will deploy if the frontpassenger seat belt is fastened, regardless of whether the front-passenger seat is occupied or not. The window curtain air bags enhance the level of protection for the head, but not chest or arms, of the vehicle occupants on the side of the vehicle on which the impact occurs. The window curtain air bags are integrated into the side of the roof frame and deploy in the area from the A-pillar to the C-pillar. Window curtain air bags 1 will not deploy in impacts with deceleration rates which do not exceed the system's preset deployment thresholds for vehicle deceleration or acceleration. You will then be protected by the fastened seat belt. The Occupant Classification System (OCS) categorizes the occupant on the frontpassenger seat by means of a weight sensor. front-passenger front air bag is deactivated. If the front-passenger's weight is transferred to another object in the vehicle (e.g. by leaning on armrests), OCS may not be able to approximate the occupant's weight category. If the front-passenger seat, the seat cover or the seat cushion are damaged, have the necessary repair work carried out at an authorized Mercedes-Benz Center. For safety reasons, Mercedes-Benz recommends that you only use seat accessories which have been approved by Mercedes-Benz. an indication of whether or not the passenger is properly positioned. lamp will illuminate when the engine is started and remain illuminated. This indicates that the front passenger front air bag is deactivated. the front passenger front air bag is deactivated. the front passenger front air bag is activated. lamp will illuminate for approximately six seconds when the engine is started and then go out. For further information, see "Air bag display messages". - Your vehicle is equipped with air bag technology designed to deactivate the front-passenger front air bag in your vehicle when the system senses the weight of a typical 12-month-old child or less along with the weight of a standard appropriate child restraint on the front-passenger seat. - A child in a rear-facing child restraint on the front-passenger seat will be seriously injured or even killed if the front-passenger front air bag inflates in a collision which could occur under some circumstances, even with the air bag technology installed in your vehicle. The only means to eliminate this risk completely is never to place a child in a rear-facing child restraint in the frontpassenger seat. We therefore strongly recommend that you always place a child in a rear-facing child restraint on the rear seat. - If you place a child in a forward-facing child restraint on the front-passenger seat: - move the seat as far back as possible - use the proper child restraint recommended for the age, size and weight of the child - secure child restraint with the vehicle's seat belt according to the child seat manufacturer's instructions - For children larger than the typical 12- month-old child, the front-passenger front air bag may or may not be activated. If the driver's air bag deploys, this does not mean that the front-passenger front air bag also has to deploy. - was occupied by a small individual, such as a young teenager or a small adult - was occupied by a child in a child restraint system, whose weight is greater than that of a typical 12-month-old child. If the SmartKey has been removed from the ignition lock or is in position 0, indicator lamp does not light up. - Sit with the seat belt properly fastened in a position that is as upright as possible with your back against the seat backrest. - When seated, a passenger should not position him/herself in such a way as to cause the passenger's weight to be lifted from the seat cushion as this may result in the OCS being unable to correctly approximate the passenger's weight category. - Read and observe all warnings in this chapter. lamp illuminates and goes out again after approximately 6 seconds. will illuminate and not go out. not illuminate, the system is not functioning. You must contact an authorized Mercedes-Benz Center before seating any child on the front passenger seat. For more information, see "Problems with the Occupant Classification System". The person on the front-passenger seat: - has the weight of a typical adult - has been determined by the system not to be a child. The OCS is malfunctioning. - Have the OCS checked as soon as possible at an authorized Mercedes-Benz Center. - Observe the additional display messages in the multifunction display. not illuminate and/or does not remain illuminated. - occupied with a weight up to or less than a typical 12-month-old child in a standard child restraint system The OCS is malfunctioning. - Make sure there is nothing between the seat cushion and the child seat. - Check the installation of the child restraint system. - Make sure that no objects are applying additional weight onto the seat. does not illuminate, have the OCS checked as soon as possible at an authorized Mercedes-Benz Center. Do not transport a child on the front-passenger seat as long as the OCS is not functioning. not illuminate or remains out with the weight of a typical 12-month-old child in a standard child restraint or less, or is unoccupied, on the front-passenger seat, do not transport a child on the front-passenger seat until the system has been repaired. The PRE-SAFE® system reduces the impact of an accident on vehicle occupants, as long as their seat belts have been fastened correctly. Although your vehicle is equipped with a PRESAFE ® system, the possibility of injury in the event of an accident cannot be ruled out. You should therefore always drive carefully and adapt your driving style to the prevailing road, weather and traffic conditions. PRE-SAFE® takes preemptive measures to protect occupants in certain hazardous situations. - the front seat belts are pre-tensioned. - on vehicles with memory function for the front-passenger seat: the front-passenger seat is adjusted if it is in an unfavorable position. - if the vehicle skids, the sliding sunroof/panorama roof with power tilt/sliding panel and the side windows are closed so that only a small gap remains. If the sliding sunroof, panorama roof with power tilt/sliding panel or a side window is obstructed during closing, the closing procedure is stopped. The obstructed sliding sunroof, panorama roof with power tilt/ sliding panel or side window opens again slightly. If the hazardous situation passes without resulting in an accident, PRE-SAFE® slackens the belt pretensioning. All settings made by PRE-SAFE® can then be reversed. If the seat belts are not released: - Move the backrest or seat back slightly, but only when the vehicle is stationary. The belt pretensioning is reduced and the locking mechanism is released. Make sure that nobody can become trapped as you adjust the seat. objects in the footwell or behind the seats when resetting the seats. There is a risk that the seats and/or the objects could be damaged. More information about seat-belt adjustment, a convenience function integrated into PRE-SAFE®, can be found in the "Seat-belt adjustment" section. Even where this is not the case, all vehicle occupants should have their seat belts fastened when the vehicle is in motion. For further information on infants and children traveling in the vehicle and on infant and child restraint systems, see "Children in the vehicle". infants and children traveling in the vehicle and on infant and child restraint systems, see "Children in the vehicle". Damaged seat belts or seat belts that have been subjected to stress in an accident must be replaced and their anchoring points must also be checked. Only use seat belts which have been approved by Mercedes-Benz. Do not make any modifications to the seat belts. This can lead to unintended activation of the ETDs or to their failure to activate when necessary. Do not bleach or dye seat belts as this may severely weaken them. In a crash they may not be able to provide adequate protection. Have all work carried out only by qualified technicians. Contact an authorized Mercedes-Benz Center. - Seat belts can only work when used properly. Never wear seat belts in any other way than as described in this section, as that could result in serious injuries in the event of an accident. - Each occupant should wear their seat belt at all times, because seat belts help reduce the likelihood of and potential severity of injuries in accidents, including rollovers. - Never wear the shoulder belt under your arm, across your neck or off your shoulder. - Position the lap belt as low as possible on your hips and not across the abdomen. If the lap belt is positioned across your abdomen, it could cause serious injuries in a crash. - Never wear seat belts over rigid or breakable objects in or on your clothing, such as eyeglasses, pens, keys etc., as these might cause injuries. - Make sure the seat belt is always fitted snugly. Take special care of this when wearing loose clothing. - Never use a seat belt for more than one person at a time. Do not fasten a seat belt around a person and another person or other objects at the same time. - Seat belts should not be worn twisted. In a crash, you would not have the full width of the seat belt to distribute impact forces. - Pregnant women should also always use a lap-shoulder belt. The lap belt portion should be positioned as low as possible on the hips to avoid any possible pressure on the abdomen. - Place the seat backrest in a position that is as upright as possible. - Check your seat belt during travel to make sure it is properly positioned. - When using a seat belt to secure infant restraints, toddler restraints, or children in booster seats, always follow the child seat manufacturer's instructions. - Adjust the seat and move the backrest to an almost vertical position. - Pull the seat belt smoothly through belt sash guide 1. - Without twisting it, guide the shoulder section of the seat belt across the middle of your shoulder and the lap section across your hips. - Engage belt tongue 2 in buckle 3. Seat-belt adjustment: if necessary, the driver's and front-passenger seat belts automatically adjust to the upper body. - If necessary, adjust the seat belt to the appropriate height. - If necessary, pull upwards on the shoulder section of the seat belt to tighten the belt across your body. All seat belts except the driver's seat belt are equipped with a special seat belt retractor to securely fasten child restraint systems in the vehicle. For further information on special seat belt retractors. For more information about releasing the seat belt with release button 4, see "Releasing seat belts". The belt strap is tightened slightly when: - you engage the belt tongue in the belt buckle and you then turn the SmartKey to position 2 in the ignition lock. - the SmartKey is in position 2 in the ignition lock and you then engage the belt tongue in the buckle. The seat-belt adjustment will apply a retraction force if any slack is detected between the occupant and the seat belt. Do not hold on to the seat belt tightly while it is adjusting. You can switch the seat-belt adjustment on and off in the on-board computer. 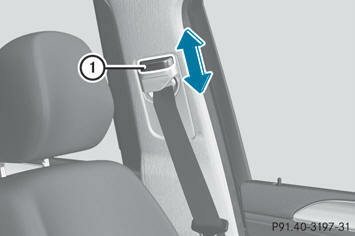 The seat-belt adjustment is an integral part of the PRE-SAFE® convenience function. More information about PRE-SAFE® can be found in the "PRE-SAFE® (preventative occupant protection)" section. You can adjust the seat belt height on the driver's seat and the front-passenger seat. Adjust the height so that the upper part of the seat belt is routed across the center of your shoulder. - To raise: slide the belt sash guide upwards. - To lower: press and hold belt sash guide release 1. - Slide the belt sash guide downwards. - Release belt sash guide release 1 and make sure that the belt sash guide has engaged. - Press release button 4 and guide belt tongue 2 back towards belt sash guide 1.
is fully rolled up. Otherwise, the seat belt or belt tongue will be trapped in the door or in the seat mechanism. This could damage the door, the door trim panel and the seat belt. Damaged seat belts can no longer fulfill their protective function and must be replaced. Consult an authorized Mercedes- Benz Center. engine start. It then goes out if the driver and the front passenger have fastened their seat belts. seconds and the doors are closed, the7seat belt warning lamp lights up. - until the driver or the front passenger have fastened their seat belts - if a vehicle speed of 15 mph(25 km/h) is exceeded once, a warning tone with increasing intensity sounds additionally for a maximum of 60 seconds or until the driver or front passenger have fastened their seat belts. belt warning lamp lights up and the warning tone sounds again. seat belt warning lamp stops flashing but continues to be lit. belt warning lamp starts to flash again if the vehicle speed exceeds 15 mph(25 km/h) once. belt warning lamp, see "Warning and indicator lamps in the instrument cluster, seat belt". The front seat belts and the outer seat belts in the rear are equipped with ETDs and seat belt force limiters. The ETDs on the driver's and front-passenger seat consist of pyrotechnic belt buckle tensioners and belt anchor fitting tensioners that are triggered together. The belt buckle tensioner is mounted on the B-pillar and the belt anchor fitting is mounted on the side of the seat. Always have both tensioners replaced after they have been triggered. The ETDs tighten the seat belts in an accident, pulling them close against the body. Seat belt force limiters, when triggered, help to reduce the peak force exerted by the seat belt on the vehicle occupant. The seat belt force limiters for the front seats are synchronized with the front air bags. These take on a part of the deceleration force. Thus, the force exerted on the occupant is distributed over a greater area. - the ignition is switched on. - the restraint systems are operational; see "SRS warning lamp". - the belt tongue is engaged in the buckle on each of the lap-shoulder belts in the front. - the front-passenger seat is occupied and the belt tongue is engaged in the buckle on the front-passenger side. The ETDs on the outside seats in the rear compartment are triggered independently of the lock status of the seat belts. is not occupied, do not engage the seat belt tongue in the buckle on the frontpassenger seat. Otherwise, the Emergency Tensioning Device could be triggered in the event of an accident.